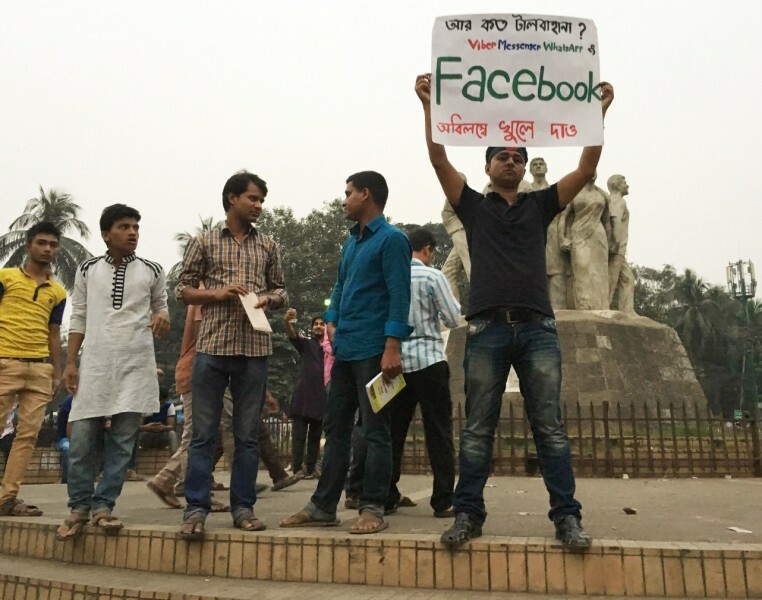 A protester near the Teacher Students Centre (TSC) of Dhaka University. The poster reads “How many excuses more? Open Viber, Messenger, WhatsApp and Facebook NOW.” Photo by Zaid Islam, under copyright. Used with permission. A look back at Global Voices’ reporting on hate speech, harassment, and political censorship on the world’s largest social network, since 2008. 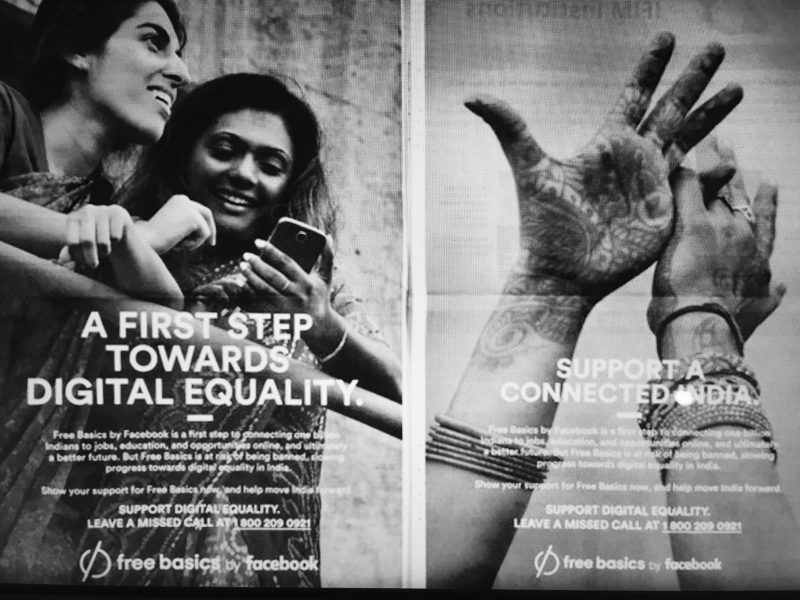 Print advertisements for Free Basics in India, from 2015. Images shared widely on social media. In spring 2017, a group of Global Voices tech and digital rights experts in Colombia, Ghana, Kenya, Mexico, Pakistan and the Philippines tested the Free Basics app against usability and open internet benchmarks that we developed in consultation with experts from the ICT and internet policy world. We published our findings here. 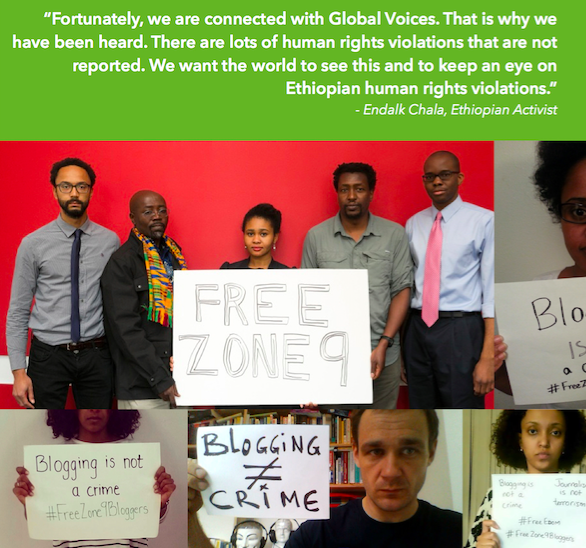 In April 2014, nine bloggers and journalists were arrested in Ethiopia on accusations of “inciting public disorder via social media” and “receiving support from a foreign government.” The detainees had all worked with Zone9, a collective blog that covered social and political issues in Ethiopia and promoted human rights and government accountability. Many of them were also contributors to Global Voices. Our community worked hard to demand the release of our jailed friends and to tell the world their story. We worked with the bloggers’ families and lawyers to report on their experiences behind bars and in court, and to promote their case on social media. The Global Voices community worked to bring international attention to the prosecution of seven free expression advocates who are facing trial in Morocco due to their advocacy. The seven advocates had sought to defend human rights, hold authorities accountable to the public, and uphold rule of law in their country. Five were charged with “threatening the internal security of the State” and two faced charges of “receiving foreign funding without notifying the General Secretariat of the government.” Among those charged was Hisham Almiraat, a medical doctor and long-time member of our community. “Who will be next?” Sketch of deceased Bangladesh bloggers by MadhuMondol. More than ten Bangladeshi bloggers and writers have been assassinated since 2013. Some of the country's most active online writers now fear they may face jail or will die at the hands of the assailants. Some under threat have left the country. Since 2013, we have covered stories about individuals who have lost their lives because of their online writing, and the ways their communities have responded and grappled with this trend. Global Voices Advocacy has been doing digital security, online mapping, and censorship-related projects since 2007. Although some of these projects were built towards now-defunct technologies, we keep them archived for readers interested in reviewing our work over time.